I knew about this game for quite a while before I played it, but I never bothered to give it a try. I dismissed it as �just another puzzle game�. When I finally got round to playing I found that it was, well... almost just another Puzzle game... except that this one is really cool! The Neo Geo may have a lot of beat 'em ups, but it also has a fairly large amount of Puzzlers too. These include the not too bad (Gururin), the good (Puzzle Bobble) and a whole truck-full of Mah-jong games (Bakatono etc.). This means that like beat 'em ups, where there are so many different games that are very similar, it needs something pretty damn special to stand out. One thing that definitely stands out about this game are the graphics, but more about those later. What about the game play? This plays a lot like the Magical Drop games. You have to move the small character at the bottom of the screen left and right. By pressing the A button, you can grab hold of some coins from the top of the screen. You can then throw those coins back up to the top of the screen and if you get a set number of the same coins together, they disappear. So far this might sound exactly the same as Magical Drop. But the thing that makes this game different is that you have to use a little bit of mathematics. It basically goes like this: If you put five of the �1� coins next to each other, they turn into a �5� coin. If you then put two of the �5� coins next to each other, they turn into a �10� coin, then five of those turn into a �50� coin and so on. When you get up to 500, put two of those next to each other and they disappear altogether. If you plan carefully you can set up some massive chains that score you lots of points and help clear your screen very quickly. 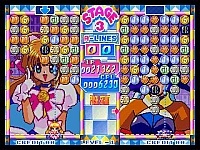 There are a couple of different modes in this game, one where you play on your own and another where you play against either the CPU or a human opponent. As I was saying earlier, the graphics in this game are quite nice. When you first turn the game on, you get treated to a very nice intro, which has some great artwork on it. In fact, throughout the whole game the presentation is of a high standard. The actual in game graphics themselves look good too. Obviously there is only so much you can do with a bunch of boring coins, but in the background there are some animated characters that look great and react when you win/lose etc. Not many puzzle games look really amazing, but overall this one has a very polished feel. 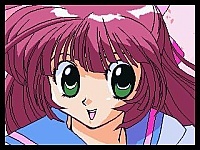 The only real problem is that the English translations are very bad, but then again most other games on the Neo Geo are badly translated from Japanese too, so it isn't a surprise. 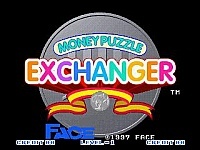 I found the sound in Money Puzzle Exchanger to be very well done too. The opening music is great and the music that plays during the game is cool too, but a little annoying occasionally. The sound effects and speech are good as well, but again, hearing some of the sound samples again and again can get tedious after a while. 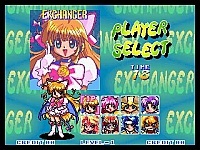 If you like puzzle games, then Money Puzzle Exchanger is one that you will probably want in your collection. It gets quite hard after you have played a few matches, but that just makes you want to keep playing until you beat it. There may be plenty of puzzle games available, but this is one of my personal favourites. I highly recommend that you check it out. One of the most well known and best puzzlers for this system. A fanastic puzzle game, very addictive! I don't know of any cheat codes for this one to be honest... I did just check around but can't find any. Sorry!